Just look at these views over the beautiful Bretagne countryside. Ideal for holidays or for seasonal rental or permanent residence. 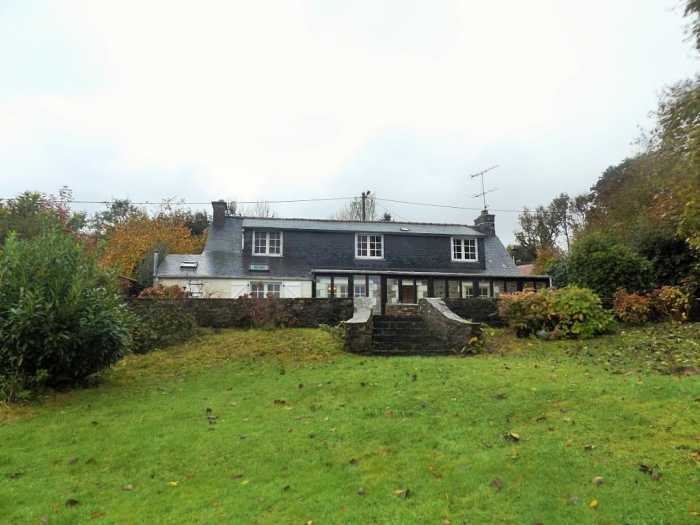 This 4 bedroom 2 bathroom home is located just outside the listed village of Loc Envel 22810, Loc Envel is the smallest commune in Brittany as well as one of the most traditional with its XVI century church. Loc Envel, is situated at the gates of the Coat An Noz National Forest, in a green setting, is a perfect place to relax, starting point for many hiking trails and mountain biking. Train: Guingamp station is at 20 km. The larger town of Guingamp is at approximately 32km with the bigger shopping centres and TGV train station (Paris 3.5h). Road: RN12 motorway junction is within 5 km. There is easy access to the ferry ports of Roscoff – 66km and Saint Malo – 151km. The airports of Brest – 88km and Dinard – 137km are also easily accessible. Access to the various beaches of Brittany are within 30 minutes where you can explore the fantastic coastline. Wooden structure with double glazed windows and doors, tiled flooring, French doors to Terrace, and living room and main entrance to house, electricity. Tiled flooring, wooden stairs to first floor, access to kitchen and living/dining room. Tiled flooring, windows to front and rear, fitted cabinets with built in electric oven, dishwasher, and gas hob. Extractor fan. Closet with washer and dryer hook space and storage. Exposed beams, wall electric heater. Tiled flooring, exposed beams, featured fireplace with wood burner, French doors to Veranda and doors to bedroom with en-suite disabled wet room, and additional family bathroom, closet. Wall electric heater. Tiled flooring, window to rear, Velux window, electric wall heater, glass door to En-suite wet room. Fully tiled, Velux window, electric wall heater, WC and sink. Walled Shower. Fully tiled, window to rear, electric wall heater, WC and sink. Bath/Shower combo with glass screen, towel rail. Wood panelling, carpet flooring, sink, window to front, electric wall heater, door to third bedroom. Garage with attached shed, access from street. Listed at 123,000 € including agency fees of 2.5% (3,000€).